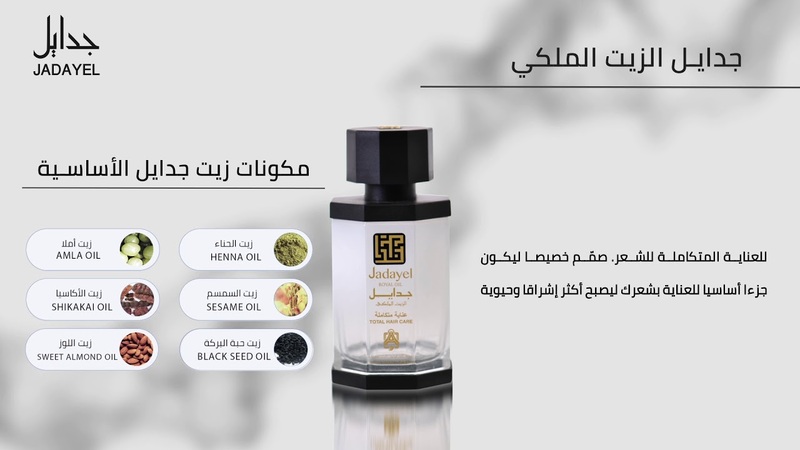 The Only Natural oil with its unique rich formula with the best generously nature given oils which carefully extracted to ensure the presence of active substances responsible for strengthening the hair follicles reaching to the edges to enjoy youthful, healthy & thick hair. جدايل الزيت الملكي عناية متكاملة الزيت الطبيعي الوحيد بتركيبته الفريدة الغنية بأفضل ما جادت به الطبيعة من زيوت استخلصت خصيصاً لتحتوي على مواد فعَالة لتقوية بصيلات وأطراف الشعر ليتمتع بالصحة والرونق والحيوية الدائمة. Anti-dandruff.Prevents hair loss,strengthen and improves the quality of hair,leaving hair nourished. Hair lengthen and conditioner,rebalancing your hair,prevents split-ends.leaving hair nourished. For healthier, invigorated scalp, nou rishies. Conditions, and improves the strength and eiasticity of your hair. Penetrating the scalp and mpisturizing the hair follicles, helping grow hair faster with cell regenerating, reducing frizz. Protects against styling and blow- drying damage, restores damaged strands to a full healthy head of hair, leaves it moist from root to tip to help repair damage. Protects,restores,repairs and rebuilds fragile damaged hair, strengthens hair from the inside to out,improving the health of hair and scalp,strengthening hair roots. Nourishing and protecting hair due to the vitamins & minerals and fatty acids which gives healthy & shiny hair. It is a natural emollient to hair.It will penetrate and make hair softer,improve hair texture and color. Boosts hair growth, contains essential fatty acids to prevent hair thinning and promote healthy growth of hair, keeps the hair moisturize, prevents premature hair greying. يحتوي على أحماض أمينية وفيتامينات مفيدة للشعر تساعده على النمو الصحي, الترطيب ومنع التساقط. للحماية من تأثير تجفيف الشعر, يساعد على تغذية وترطيب الشعر, يعالج التلف ويمنح الشعر نعومة وحيوية. لحماية وإعادة بناء الشعر التالف, يغذي ويحسن بنية ونسيج الشعر من الجذور حتى الأطراف ليجعله غزيراً. يساعد على تغذية الشعر وحمايته, لاحتوائه على الفيتامينات والمعادن والأحماض الدهنية التي تعطي شعر صحي ولامع. يسهم في تقوية بنية الشعر بشكل ملحوظ ويمنع من التساقط, يضفي عليه نعومة ولمعاناً, ويمنح الشعر قوة كثافة وليونة.